Module graphic parking position has two purposes. The first purpose is to review the actual or planned status on the apron in one day. 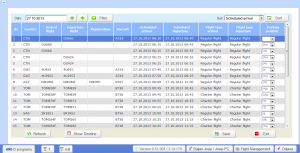 The data for this purpose are retrieved from the current data of the Flight Management module. This allocation is related to the operational work of the flights in real-time and short term positions. This screen has no editable fields and parking positions are entered in the main form of Flight Management. Another purpose of the module is a long-term / seasonal advance planning of capturing parking positions based on the data from seasonal flight schedule. 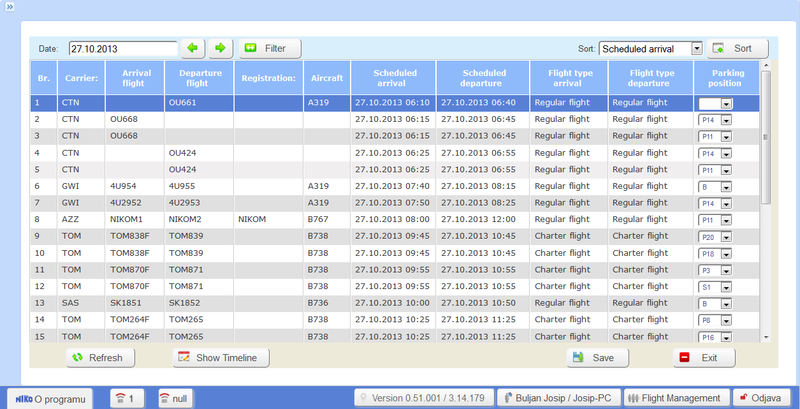 Data for this purpose are generated and retrieved from the table of the scheduled flights. The primary purpose is to examine the possibilities of integrating the planning of a number of aircraft with regard to the capacity of the airport apron. Field Parking position is in this mode, editable and the user can change the planned positions for aircraft parking. In addition to calendar parking position, we check the number of operations that the airport needs to be done in one hour. Thus, the Gant diagram printed and the number of operations that are planned in each hour.